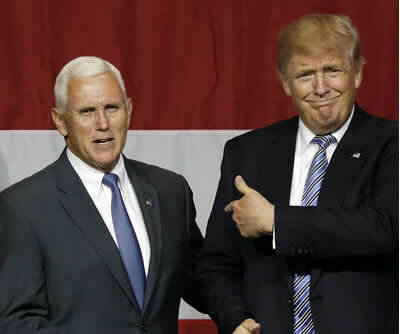 23422 1 year ago William Swatos Palm Desert, CA Pence knows everything Trump did to steal the 2016 election. Everything. He must be held accountable for it and MUST NOT become president when Trump is removed for his crimes. 23421 1 year ago pj webster kennebunkport, ME Please focus on the actions and statements of this devious potential president. 23414 1 year ago Anonymous Hudson , NH Never forget - the media created Trump! The only way they can redeem their sorry selves is by exposing him for the abortion that he is. 23413 1 year ago Donna Russell Davis, CA Hold each member of T-rump's pals FEET TO the FIRE. 23412 1 year ago Donna Russell Davis, CA Pence is T-rump's handmaiden...equally guilty.